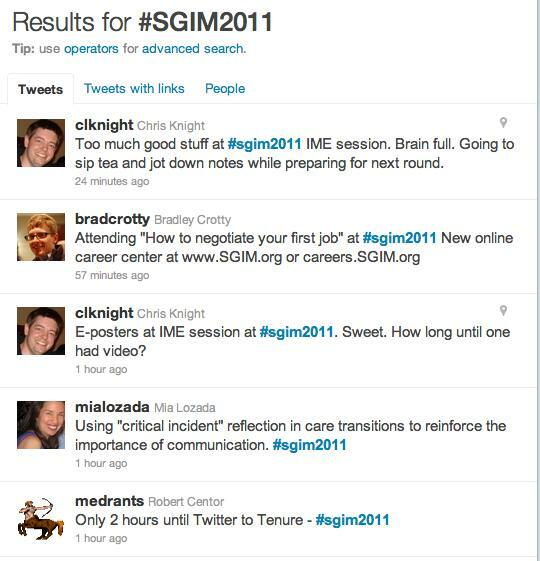 I have the distinct honor of wrapping up the online prelude for the SGIM Social Media Workshop “From Twitter to Tenure”. So far we have heard from Alex Smith (@AlexSmithMD) from GeriPal, Vinny Arora (@FutureDocs) from Futuredocs, Bob Centor (@medrants) from DB’s Medical Rants, and Kathy Chretien (@MotherinMed) from Mother’s in Medicine. 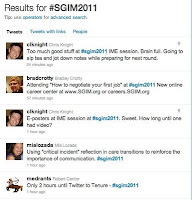 The previous posts all describe how social media can advance an academic career. Rather than restate many of the same points, I’ll just summarize many of the themes brought up by these clinicians, while highlighting my own personal story. "The most important old lesson is that one must write to become a better writer. Blogging made writing a habit." 2. Building national connections: On a day to day basis we all spend most of our time in our local community. As important as this is, academics requires junior faculty members to quickly become known on a national stage. Annual meetings are a great way to do this, but they only occur, well, annually. Social media allows me to meet people throughout the year and develop connections that I would never have the opportunity to create. 3. Amplifying your voice: the reason that Alex and I initially started GeriPal was that we wanted a place to express our opinions for everyone to see. We found that the more we wrote the more people read. As Bob Centor wrote in his blog post, this helped us build a brand and also gave us some street cred. For instance, writing on topics that were important to me has led to several interviews with the New York Times. Dr Widera? Do you twitter? ?